Whenever I think of buying furniture, IKEA is the first store that pops into my head. It is good value, sells just about everything you can imagine and you can order online (although going to the store is very cool!). But there are other websites where you can buy cheap furniture from. Here are my favourite websites for buying cheap furniture. If you are looking for a new bed then this is the perfect website for you. 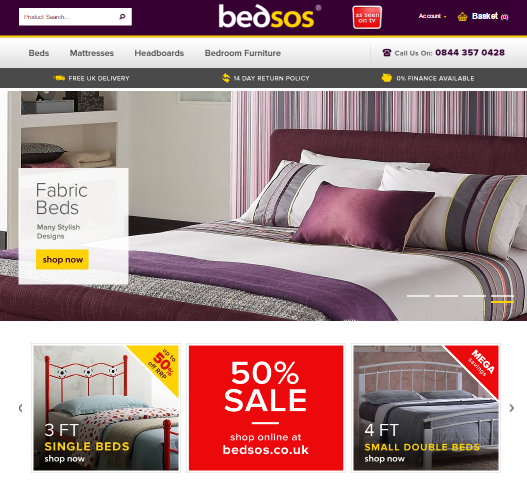 Bedsos is one of the largest online retailers of beds and mattresses. They have a huge range of products including metal beds, pine beds, leather beds and children’s beds – and they come in all sorts of shapes and sizes! And it’s not all beds and mattresses, BedSOS sell everything you need to complete your bedroom set. If you’re worried about not having the budget for real leather then have a look at the range of faux leather beds that BedSOS stock. What is faux leather? It is a man-made material that gives the appearance of real leather for a fraction of the price. If you’re a bit short of cash then why not consider one of their finance options? You can choose to pay over 6, 10 or 12 months and the interest you will pay is £0! Have you ever wondered what happens to furniture that has been returned, over-ordered or cancelled? Wonder no more… some of it is bought by Trade Secret to be sold to you for a fraction of the price! Legally, they cannot mention the name of the stores (everything gets ‘delabelled’) but it is clear that it comes from high street stores like John Lewis, BHS and Marks and Spencer. This family run business pride themselves on being able to offer you beautiful furniture for less than you would buy it on the high street. Get Furnished sells everything you need to complete your bedroom, dining room or living room and they will contact you to find the most convenient delivery day. Some people love spending time trawling eBay for a bargain – and it can pay off! You can find almost everything you imagine on eBay and it’s not all second-hand furniture either. People sell on eBay when they are trying to get rid of unwanted birthday/wedding presents, items that were purchased by mistake or maybe even beds that they couldn’t get up the stairs. Like eBay, Amazon sells almost everything you can imagine and you can get some really good prices! You can search for particular pieces of furniture or just keep an eye on their daily deals. One of the things that I like about the Amazon search function is that you can search by room. This is great if you are trying to tick a few things off your list – you can even buy things that you hadn’t even thought you needed! Some retailers also sell older, discounted or discontinued stock on eBay or Amazon so if you’ve seen a particular piece of furniture in a shop, search for it online and see if you could get it cheaper. 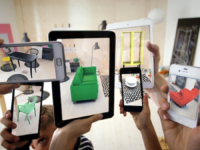 If you do plan on buying your furniture on eBay or Amazon UK, then I suggest you take a read of this post – it is full of tips and tricks to help you get the best deal. If you’re looking for furniture that is functional rather than fashionable then these big name stores might be your best option. Tesco Direct, Argos and Asda all have a massive range of furniture for sale through their online stores and it is generally much cheaper than high street competitors. These stores are perfect for any budget as they normally start with the ‘home brand’ or ‘value’ range and get more extravagant depending on how much you want to spend. When I first moved to London, I discovered how good of a resource Gumtree was. I could use it to help me find a place to live, a job and a bike to get from one place or another. It is also an excellent site for finding second hand furniture. The furniture is of varying styles and quality so there is a price suitable to fit any budget – there is even a freebies section which is definitely worth a look! Remember though, you will generally have to collect the items you buy so make sure you have suitable transportation. There are a few other websites (like Freecycle and Freegle) where you can pick up furniture for free. If this idea is appealing to you then take a read of this post. 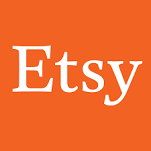 Etsy is an online marketplace featuring over a million independent sellers from all over the world. The site focuses on handmade, vintage and creative pieces so it is perfect if you are looking for something a little bit different. The good news is that because Etsy deals with small businesses and regular people, you can generally pick up some really cheap deals. You can even do your shopping on their handy app available on both iTunes and Google Play. Methods of payment, delivery charges and how long it takes for you to get your item will vary depending on the seller. If you want to save money on delivery then you can choose to only search for items in your local area. There are plenty of websites where you can buy cheap furniture – these are just a few of my favourites. As you can see there are plenty of options for every style, budget and personal preferences. Remember there is more to furniture shopping than a trip to Ikea!